When looking at the exterior of your home or business, the roof plays a significant role. First impressions make an impact. A well maintained, dependable roof is one indicator of the overall care a home or commercial building has received. One of the best materials for a roof is metal. 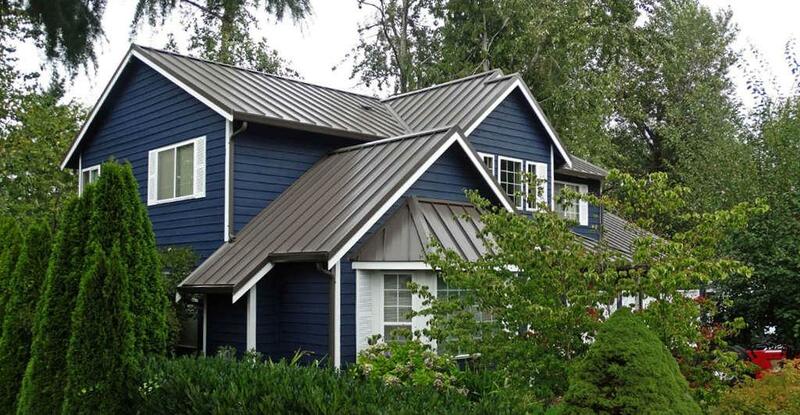 Metal roofing is accredited with the wide variations of color and versatility, as well as energy efficiency. Roofing materials are generally one of the least energy efficient components of a home. Heating and cooling typically consume about 30% of your home’s energy. Much of that energy is lost because heated or cooled air is lost through the roof. Metal roofs reflect the sun, which reduces the amount of heat penetrating into the home. According to the Department Of Energy, a reflective roof can reduce peak cooling demand by 10 to 15 percent. Metal roofs systems warranties can range all the way up to 50 years, while most standard shingle roof warranties are only 25 years. One of the reasons for this extended lifespan is that metal roofing materials are very durable. Metal roofs aren’t as vulnerable to damage from hail or wind as most shingled roofs. In addition its durability, metal roof systems have a unique aesthetic feature that aid to it’s popularity and functionality. One such feature is the standing seam, which gives a metal roof superior water tight qualities and a sleek, modern appearance. Standing seam metal roofing is defined as a concealed fastener metal panel system that features raised vertical seams with a broad, flat area between the two legs. Standing seam systems can be used for either metal roofing or metal walls. Because the seam is hidden below the roof surface, the metal roof is impenetrable to water. Metal panels aren’t just for roofs, they make a very durable decorative accent area to a commercial building and are excellent for outdoor structures, like sheds or barns. These outdoor applications require durable, long lasting metal that will stand up to the weather. Other materials, such as wood and stone, will deteriorate over time and will have to be replaced. To help prevent this, our agricultural metal is coated with zinc. Many people still believe the myths about metal roofs. No, you aren’t increasing the likelihood that lightning will strike your house. In fact, the metal disperses the energy and, since the metal is fire resistant, it’s actually protecting your home. Your metal roof is highly durable, so damage from hail, wind, rust, and even the weight of snow are unlikely to occur. Metal roofs will not crack, break, peel or blister, which are issues with other roofing materials. All roofing materials will fade in color over time, which is always a concern for a roofing repair or replacement. At some point, every roof will have a problem that needs to be addressed; metal roofs are no exception. While infrequent, repairs and maintenance are necessary to maintain lifespan of your roof. Specializing in metal repairs for both low and steep slope roofs, Guardian is competitively priced and expertly qualified to handle your roof issues. Guardian prides itself on quality roofing, installation, repairs and inspections. To properly address your roofing concerns, there is a diagnostic fee of $350.00 (plus tax). Metal Roof Systems are not as easy to take apart as composition, shake or tile roof systems. The time invested to conduct a safe & proper diagnostic takes time and resources that come at a cost far beyond what we charge but as an industry expert we want to offer this service. Partnering the Best with the Best! With Guardian Roofing’s buying power we have access to every major metal distributor, but even more meaningful to our clients is our ability to have an alliance with the foremost experts in everything metal roofing, Metal Roof Specialties. We not only enjoy the ability to support a local family run business, but they truly are the foremost authority on everything metal!